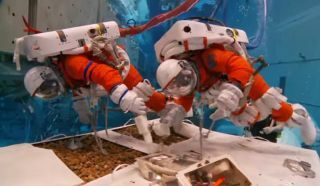 NASA astronauts Stan Love and Steve Bowen test tools and methods for exploring an asteroid in an underwater 'spacewalk' in this still from a NASA video released on May 9, 2014. The astronauts wore a modified version of NASA's orange launch and entry suits used on space shuttle missions. Two NASA astronauts went underwater last week to test out some spacewalking techniques that could be used to explore a captured asteroid a decade or so from now. Astronauts Stan Love and Steve Bowen — who have 62 hours of spacewalking experience between them — descended into NASA's Neutral Buoyancy Laboratory pool on Friday (May 9) wearing "escape suits" from the space shuttle that could be modified for possible use on extravehicular activities (EVAs). "We're working on the techniques and tools we might use someday to explore a small asteroid that was captured from an orbit around the sun and brought back by a robotic spacecraft to orbit around the moon," Love said in a statement. "When it's there, we can send people there to take samples and take a look at it up close," he added. "That’s our main task; we’re looking at tools we’d use for that, how we'd take those samples." Astronauts Stan Love (left) and Steve Bowen perform a mock asteroid exploration spacewalk underwater while wearing modified versions of the orange launch and entry suits used on space shuttle missions in this still from a NASA video. The aquatic 'spacewalk' aimed to test tools and techniques for NASA's Asteroid Initiative Mission. One key goal was to evaluate a pneumatic hammer that could be used to extract a "core sample" from the asteroid. These cores show the layers of material that accumulate over time, and would be a sort of time capsule of the early solar system. The tool represents an improvement over the typical way geologists collect such samples, NASA said, because swinging a hammer could produce rock shards that would rupture a spacesuit's face plate. The astronauts also tested the Advanced Crew Escape Suit, a pressure suit worn during entry and descent on shuttle missions after the Challenger explosion. NASA aims to make the suit functional for spacewalks as well, so that astronauts don't have to carry two pressure suits into orbit on the Orion spacecraft. "We need some significant modifications to make it easy to translate," Bowen said in NASA video interview while wearing the spacesuit underwater. "I can't stretch my arms out quite as far as in the [space station spacesuit]. The work envelop is very small. So as we get through, we look at these tasks. These tasks are outstanding to help us develop what needs to be modified in the suit as well." Steve Bowen is lowered into the Neutral Buoyancy Laboratory at Johnson Space Center to test spacewalk suits and tools for a mission to an asteroid. NASA aims to send astronauts to a captured space rock by 2025 using Orion and its huge Space Launch System mega-rocket, which are slated to fly together for the first time in 2021. However, this White House-backed plan has so far met with resistance from some legislators in Congress, who have voiced skepticism about how it would help the agency prepare for other missions beyond Earth orbit, particularly to Mars. NASA counters that the mission would advance "a number of technologies needed for longer-term plans," including a Mars mission.